Sophomore physical education major Scott Arneson midlift in the third period of the 133-pound match. The University of Wisconsin-Platteville wrestling team came away with a decisive victory, 30-13, against Loras College in the first team dual of the season. Prior to the beginning of the dual, the Pioneers’ three captains were named. The captains perform at several different weight classes. Scott Arneson at 133lbs, Jon Goetz at 174lbs and Grant Wedepohl at 184lbs will be trusted to guide the Pioneers to success this season. 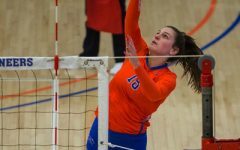 All three athletes are sophomores at UW-Platteville. The Pioneers’ dual against the Duhawks had a special significance other than the battle on the mat. Nov. 17 was the “Headlocking Hunger” event. Many of the other athletic programs on campus competed in donating the most canned goods for children that need extra assistance. The Head on Hunger organization is based out of Asheville, North Carolina and started in 2014. The Pioneers got involved for the first time last season with Headlock on Hunger. The event’s proceeds are sent to the Platteville Food Pantry. The women’s basketball team donated the most for the second consecutive year, contributing to the athletic department’s donation of over 1,500 pounds of food. The goal was evident that the Pioneers needed to come out fast. Zachary Stenger and Scott Arneson earned nearly half of the team’s points with two pins to start the dual. These pins were valuable in setting the tone for the entire match. 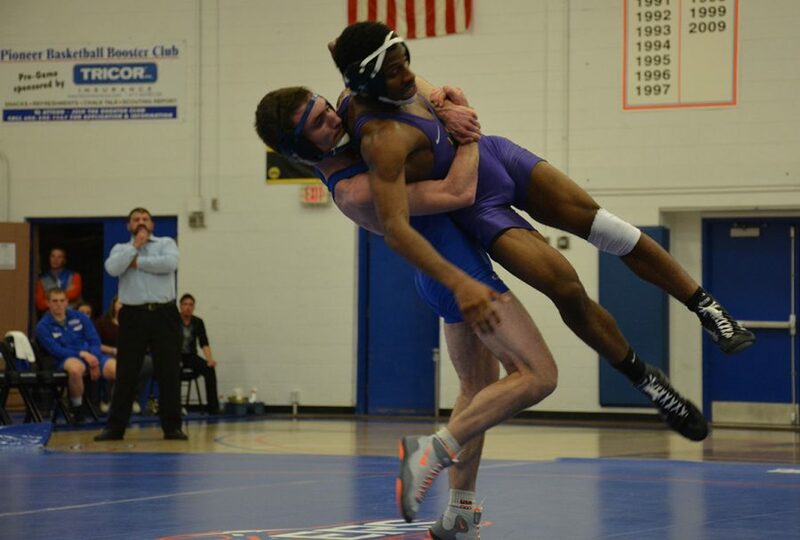 The fast start helped propel the Pioneers to win seven of the ten weight classes. The frustration continued to mount for the Duhawks when their heavyweight nearly didn’t shake sophomore criminal justice major D’Andre Johnson’s hand after losing to Johnson in an 8-3 decision. “Funny enough, I sing songs in my head to stay calm before, during, and after matches, but seriously I think how this will look on my team before making rash decisions,” Johnson replied to explain his strategy of how to keep cool in the worst of situations. The Pioneers can be proud of the resilience they showed in every match. After all, no pins were allowed compared to the three that were earned. This Saturday, the wrestlers will be challenged at the Coe College Invitational in Cedar Rapids, Iowa and will return home on Dec. 10 against the UW-Whitewater at noon.